Khi dơn về, copy 1 file rom Black hay White vào trong thư mục đã giải nén, mở xdeltaGUI, chọn patch là file patch bản mình muốn, Rom là file rom, xong nhấn apply, chờ đến khi xuất hiện 1 file cùng tên rom có thêm _patched với dung lượgn khoảng 200+mb là ok.
Blaze Black and Volt White are hacks of Black and White that work primarily in allowing many, many Pokémon to be captured in the wild, as well as completely editing every trainer roster in the game to fit these new boundaries. Anyone who has played either my Fire Red Omega or Spirit Gold will probably be familiar with the sort of changes I make; in addition to the aforementioned features above, changes have also been made to features such as Pokémon types (in limited quantities), level up moves, attacks, evolutions and stats. The changes are overall made for a more 'convenient' playthrough, though also with the intention of making important battles (Gym Leaders, Elite Four, later rival battles) a lot harder than previously. * A grand total of 606 Pokémon are available in any one of the two versions! The missing 43 Pokémon are every legendary that cannot ordinarily be caught in the game (counting Reshiram/Tornadus as part of the 606 on Blaze Black, and Zekrom/Thundurus as one of the 606 on Volt White.) Every non legendary is capturable somewhere! * Every single trainer in the game that is regularly accessible has been edited. This can mean different rosters, different Pokemon, higher levels etcetera. * Every single area in the game has had its wild Pokémon edited to some extent; post credit locations not so much, but everything before the Pokémon League has been substantially edited to have an entirely fresh lineup of Pokémon to capture. * Particularly important battles such as Gym Leaders and Elite Four will now have you up against six Pokemon, which have been handpicked to fit the trainer's 'personality' as close as possible. This in particular is a trend of my hacks, and you will be very familiar with it if you've played either of the other two. * A couple of attacks have had their power, accuracy, PP and even type edited. * Every Pokemon that cannot be evolved in the game regularly (i.e. trade evolutions such as Graveler, Magmar and Porygon2) now have alternate evolution methods that allow their use. 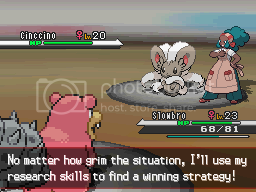 In addition, Slowpoke is now able to evolve into Slowbro through having a Shellder in the party. No more waiting until Level 37! 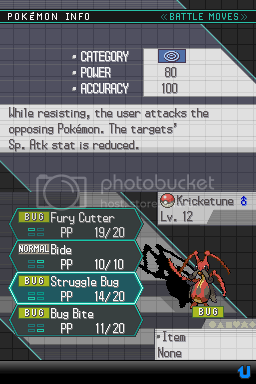 * The stats of some Pokémon have been edited - in most cases, this has been applied to Pokémon that were weak to begin with such as Butterfree, Mightyena or Kricketune. * Secondary abilities have been added to almost every Pokémon. A great chunk of these are Dream World abilities (with a DW ability replacing a current ability if worthwhile) though some Pokémon have received new abilities altogether. Say hello to Sheer Force Emboar and Regenerator Starmie! * The level curve is now significantly sharper, taking greater advantage of the Black and White EXP system. It is recommended you use the Lucky Egg received in Chargestone Cave as the levels are built as though you ARE using it! You can also steal Lucky Eggs off of wild Chansey in shaking grass on Route 6, what now have a 50% chance of holding a Lucky Egg. * A few changes to Pokemon types have been made. Most notably, the Unova starters have been changed entirely type-wise to make them far more interesting than before. You now have the choice of a Grass/Dragon Serperior, Fire/Dark Emboar or Water/Fighting Samurott! 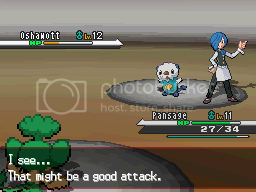 * The level up moves of certain Pokemon have been edited, particularly in the case of those what previously had a poor movepool such as Vanilluxe or Klinklang. TM/HM compatibility has also been edited in some cases, such as Lilligant now being able to learn Shadow Ball and Psychic, or Klinklang being able to learn Wild Charge and Earthquake. * Documents have been made that detail every single change in the game, making it easy to see when Wild Pokemon are, what Level Up move changes there are etcetera. These are included in the download. * All of the regular differences between B/W are there - minus the version exclusives - so the 8th Gym Leader, the appearance of Opelucid City and Black City/White Forest all apply. * The teams of Drayden and Iris are slightly different from each crazy. In addition, N's final team also differs very slightly depending on the version. * With the current lack of B/W tools at the moment, the majority of this hack was done with Cygnus Hex Editor. A LOT of hex values had to be changed for the result you see here! * KazoWAR's Trainer Editor was an incredibly useful tool in getting this done, especially with the 1.1a upgrade. Thank you very much! * Pedro250's 5th Gen Evolution Editor was also a great help in simplifying what could have been an annoying task. Again, thank you. * 0ma/0mastar/afcmark15: A friend of mine what worked plenty as an idea suggestor for the hack, as well as handling the stat and ability changes of the first 250 Pokémon and acting as advisor for the remaining 399. To put it simply, my partner-in-hacking. * elementking1: elementking was the person what gifted me with the knowledge of how to do nearly all of the hex editing that I needed to do; the Wild Pokémon hex was about the only thing I figured out myself! Without his help, things such as attacks, base stats and level up move editing would not have been possible. A huge thanks for the information! * Drayano: Obviously some credit goes to myself, as with exception for what 0ma did, I did everything in the hack including designing and editing Wild Pokemon, trainer rosters, adding level up moves etcetera. It was a fun trip, to be sure. * Dewgong/Frostbite: Also worked as an idea advisor, and was good to bounce ideas off of. Most of you will know him as the creator of the Azure Horizons hack which won PokéCommunity's Hack of the Year award in 2009. You can download from any of the six links below. The download contains xdelta, xdelta GUI, the patches for both Blaze Black and Volt White and the four documents that detail changes and other useful details. Theo như trong screenshot thì back sprite giống như trong BW fai ko nhỉ? - 1 số stats, move của Pokemon có thể thay đổi. - ABility của PKM hầu hết là abi 2, DW. 1 số con lại có abi hoàn toàn mới như Emboar với Sheer Force. Last edited by GNadox; 04-04-2011 at 11:33 PM. Last edited by heocon-tuankiet; 20-05-2011 at 07:28 PM. Có ai viết cái danh sách các Pokemon xuất hiện ở các nơi hộ với, chứ giờ chẳng biết con nào xuất hiện ở đâu cả??? Mình download về rồi! mà sao khi chạy trên No$gba không được dzậy bạn! Sau cái phần giới thiệu tên game rồi click New Game xong là màn hình đen thui luôn!!! !Help me!! !